Spoilers for both Blade Runner and Blade Runner 2049 follow. First things first: Blade Runner 2049, the future-noir freakout starring Ryan Gosling and Harrison Ford, is a brilliant science-fiction film that doubles as a big-budget chunk of pop entertainment that will likely rake in piles of money and please audiences in the process. The hugely anticipated sequel to 1982's original Blade Runner has director Denis Villeneuve (Arrival) taking over the helm and creating a dark and narcotic visual landscape, with a tightly crafted script that anticipates a grim post-human future. For newbies or anyone just casually acquainted with the first film, though, Blade Runner 2049 may be more than a little confusing. At nearly three hours, 2049 tells a story that's deep, dense, and packed with subtextual significance. 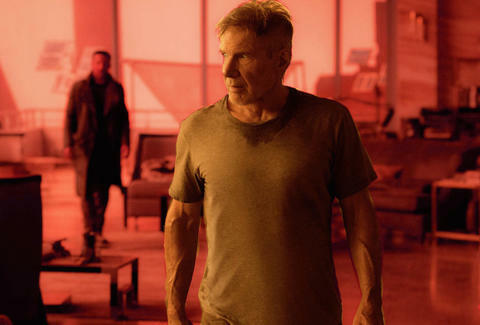 While it can be enjoyed on its own terms, you'll want a quick primer to appreciate the film's narrative resonances, especially because one of the central mysteries of the first film -- is Harrison Ford's Rick Deckard actually a replicant? -- still churns up debate and has enormous implications for understanding both movies. The new movie takes place in 2049 Los Angeles, where Officer K (Gosling) serves the city as a “blade runner,” an officially sanctioned bounty hunter tasked with tracking down and killing hyperadvanced androids known as replicants. Earth has been demolished by war and climate catastrophe, most plants and animals are dead, and replicants are chiefly used as slave labor for off-world colonies. The twist is that K is himself a replicant, part of the newest generation of machines assembled with limited lifespans and behavioral inhibitors. The rogue replicants he's assigned to kill -- or “retire” in the euphemistic parlance of the day -- are older-model replicants with open-ended lifespans who rebelled against their human masters. In the original film, Harrison Ford played Deckard, a world-weary blade runner operating 30 years earlier than the events in the new movie. The central romantic drama there was that the human cop Deckard eventually fell in love with one of his assigned targets, a replicant named Rachel, played by Sean Young. But here's the key that will unlock those deeper layers of significance in the new film: In the original Blade Runner, there are strong indications that Deckard himself was a replicant but didn't know it due to synthetic memory implants. Several visual and narrative clues are present in the various cuts of the first film, and the general consensus is that Deckard is indeed a replicant. For instance, in Ridley Scott's 1992 Director's Cut of the film, the filmmaker added in the famous “unicorn scene” dream sequence that appeared to confirm the Deckard-as-replicant speculation. Early in the film, Deckard dreams of a unicorn during a drunken reverie. Later, one of Deckard's fellow blade runners, a wigged-out dandy named Gaff (Edward James Olmos), leaves an origami unicorn for Deckard to find. This suggests that Gaff knows Deckard's memories, which means they're implanted, which means he's a 'bot. "[Gaff] doesn't like Deckard, and we don't really know why. If you take for granted for a moment that, let's say, Deckard is a Nexus 7, he probably has an unknown life span and therefore is starting to get awfully human. Gaff, at the very end, leaves an origami, which is a piece of silver paper you might find in a cigarette packet, and it's a unicorn. 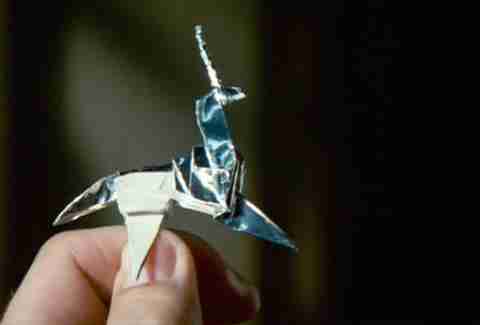 Now, the unicorn in Deckard's daydream tells me that Deckard wouldn't normally talk about such a thing to anyone. If Gaff knew about that, it's Gaff's message to say, 'I've read your file, mate.' ... and therefore Deckard, too, has imagination and even history implanted in his head." Yet some viewers who work strictly by what's presented in the film still feel there's no definitive answer to the question of whether Deckard is a replicant -- after all, the aforementioned tension is based on the idea that he's a human falling for a replicant, so the debate becomes more ambiguous. This ambiguity is a worth keeping in mind as you're going into 2049. I'm about to bump up against some nuclear-grade spoilers, and I'll try to be careful, but if you want to go into the new movie totally fresh, you'll want to come back to this page later. 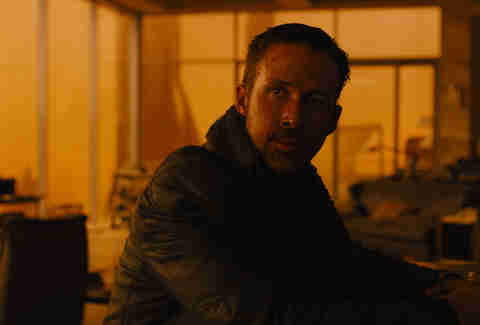 It's established in the first few scenes of 2049 that Officer K, Gosling's character, is definitely a replicant. Later revelations, however, suggest that K might actually be human after all, or if not technically human, a new man-machine evolutionary hybrid that is born (rather than assembled) and has a soul (rather than software). In other words, director Villeneuve essentially inverts the central ambiguity of the first movie by giving us a robot hero who might actually be human. Further complicating matters is the fact that Deckard, our hero from the first film, returns in the final third of the new film, where he's presented as one of the rogue older-model replicants that K is hunting down. The mystery of the first film appears to be resolved as we learn that Deckard is, indeed, a replicant. Those familiar with the first movie will want to pay very close attention to what the new film actually reveals about Deckard. We're certainly given scenes and dialogue that suggest Deckard is a machine, but we're also required to make certain assumptions. “We were being hunted!” Deckard tells K in one critical scene. But listen to how Villeneuve sequences the dialogue in this exchange. The word “we” could mean replicants... or it could mean just Deckard and Rachel, as a pair of fugitives. In the context of the scene, that line of dialogue is deliciously and deliberately ambiguous. Other scenes that seem to indicate Deckard is a replicant require similar assumptions, which is no accident. Devotees of the first movie will note that Villeneuve performs this inversion trick throughout 2049, mirroring scenes and motifs from the original film with wink-nudge mischief. These mirroring tricks can be found in the music, the costumes, the sets, the camera placements, and even the casting. So why not the central mystery that Blade Runner fans have been debating for 30 years? Now, I concede I've only seen the film once so far, and I was mightily distracted by Roger Deakins' cinematography, which was threatening to pop my eyeballs right out my skull. But contrary to what you might be hearing, Blade Runner 2049 does not definitively answer the question, “Was Deckard a replicant?” It celebrates the question itself. After you see the new movie, check out our breakdown of the Blade Runner 2049 ending. Glenn McDonald is a freelance writer, editor, and game designer.